While excitation usually originates within the gear mesh, it then radiates throughout the mechanism and is amplified by the housing. Understanding this will lead to better design. The prediction of gear noise may normally be treated as a classical source/path/receiver problem. 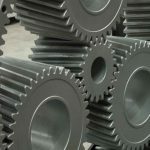 Usually the excitation occurs in the gear mesh and the path includes the transmission of forces and motions through the shafts and bearings to the gear housing, which in turn radiates the noise. This paper focuses on the source aspect of the problem and identifies the major sources of gear whine noise and develops a metric that incorporates these sources into a single equation. An example then shows how the micro-topography of a gear set affects several of the excitation components. A computer program that predicts the load distribution and motion errors of a gear pair is used for the analyses. We will first discuss each of these excitations and then propose a possible excitation metric equation that accounts for each of these factors. Tooth impacts: Impacts have the longest history as an explanation of gear noise. The main form of this argument is that as the teeth enter contact there will be kinematic mismatches that result tooth tip impact forces that are transmitted through the bearings. These impacts, which happen when teeth enter and leave contact, occur due to tooth deflections and/or tooth spacing errors. However, they are of such short duration that they possess little energy at gear mesh frequency and its lower harmonics. 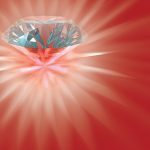 Also, practitioners have learned that by providing adequate removal of material from the tooth tips (tip relief), these entering and leaving impacts may be totally avoided. 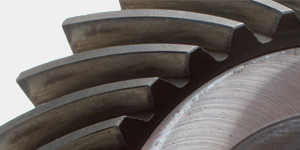 Mesh stiffness variations: In heavily loaded gears, as the number of tooth pairs in contact changes, abrupt changes in the gear pair stiffness occur (the mesh of spur gears with two tooth pairs in contact is roughly twice as stiff as when one tooth pair is in contact). 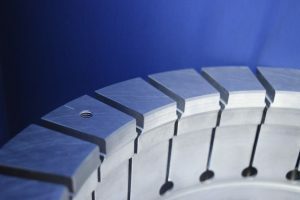 This variation, which is greatly reduced by using helical gearing, results in accelerations and decelerations of the gear pair that result in dynamic mesh forces. However, the resulting motion error due to these stiffness changes may be treated as a transmission error excitation (see next section). Again, tip and root reliefs provide means of reducing the effect of stiffness variations. Transmission error: In its simplest definition, transmission error is the deviation from perfect motion transfer of a rotating gear pair. A gear pair that has constant input rotation speed and constant output rotation speed has zero motion dependent transmission error and is said to have perfect or conjugate motion transfer. The time variation of transmission error at mesh frequency and its harmonics is predominantly due to two factors, the first being a deviation in the tooth shapes from conjugate shapes (involute shape for parallel axis gears) and mesh deflections due to transmitted load (effect of mesh stiffness variation). Minimizing transmission error has long been seen as the most important factor in minimizing gear noise [2-6]. It should be noted that one may cancel the effects of mesh stiffness variation by intentionally providing tooth shapes with deviations from perfectly conjugate shapes. 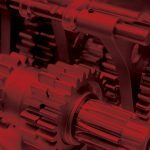 In doing so, it is important to minimize transmission error in the torque range at which the gear noise is a problem. Since stiffness variation changes with torque loading, the optimum profile modification at one is likely not to be an optimum at another load. 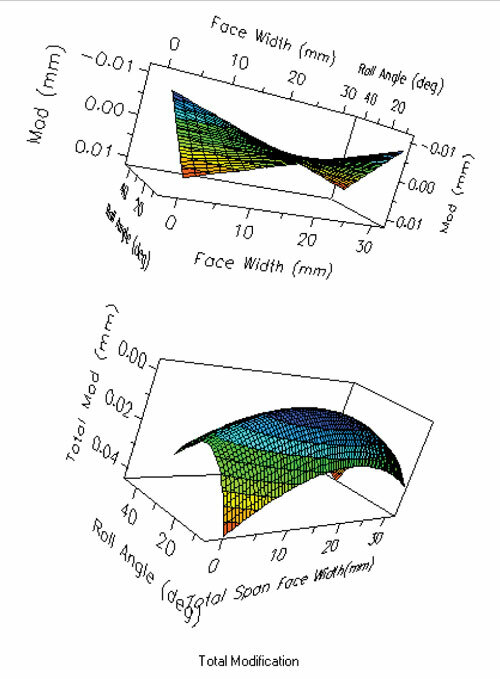 Force axial shuttling: This factor, which was investigated by Borner and Houser , is due to the slight axial shifting of the centroid of the mesh force and in the case of right angle gears the changing in the direction of force application, that occurs as the lines of contact shift when the gears rotate through mesh. Since this quantity is the result of elementary statics analysis, it is easily justified as a real gear noise excitation. Houser and Harianto  have created a means of expressing this excitation in terms of a time varying bearing force that is created due to the shifting of the transmitted mesh force centroid. 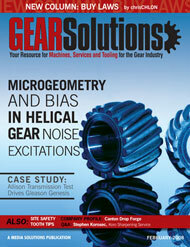 Friction: Virtually all gear types have relative sliding between meshing tooth pairs. As the contact lines proceed through mesh, the force due to friction varies at the mesh frequency and is another logical gear noise excitation. The main issues with regard to this force are the nature of the friction, whether it is Coulomb or viscous, and if Coulomb, the value of friction coefficient that should be used. 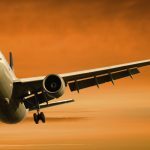 The coefficient of friction is most certainly a function of lubricant viscosity  but is also a function of other factors such as surface roughness, sliding velocity, etc. 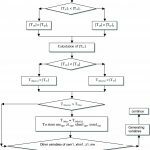 Values of friction coefficient between 0.03 and 0.07 have been typically used for lubricated gear contacts [10,11]. The viscous force is a function of the relative sliding velocity and will be greatest near the tooth tips and will decrease as contact approaches the pitch point, where true rolling motion occurs. 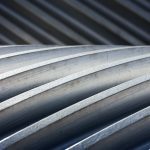 Air and lubricant entrapment: Both of these excitation possibilities are related to the pumping action of the gear teeth in mesh, namely that air and lubricant that are trapped in the clearance region of the meshing teeth need some avenue of escape. 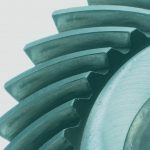 In high speed gearing, the forces generated in moving the fluids out of the mesh may be substantial and hence can be excitations of mesh frequency noise. Fi = an impact force that contains two factors, one related to entering impacts (acts slightly off line of action) and the second being a viscous force caused by sliding impacts (acts at a right angle to the plane of action). Because our goal is to develop an excitation measure that may be applied by gear designer, the above equation will be posed as a static excitation in this paper. An alternative would be to perform a dynamic analysis of the gears and their supporting shafting in order to calculate a dynamic bearing force, in which case one would need to use the mesh force as the excitation [12,13]. Because we are calculating a static excitation, approximations will be needed for Fi, Fte and Fal, since they will be affected by dynamics. The impact force that is due to corner contact is approximated to be along the line of action, and a second impact force due to the viscous sliding impact is taken at right angles to the line of action, as is the friction force. In our subsequent analyses, we are going to assume that these forces are of such short duration that their mesh frequency components are negligible. We are also going to neglect the entrapment force, since it is felt that it becomes important only for extremely high-speed gearing. We essentially have a pretty good feel for the evaluation of the shuttling force and the friction force (other than the approximation of the coefficient of friction), but in terms of obtaining an equivalent transmission error force, one has to look very closely at the dynamics of the situation. Figure 2 shows the respective transmission error and friction excitation frequency  for a model similar to that of Figure 1. The line-of-action (LOA) transmissibility indicates bearing forces that result from transmission error excitations, and the off-line-of-action (OLOA) transmissibility indicates bearing forces due to friction that occurs at right angles to the line of action as indicated in Figure 1. We see here that at very low speeds, the excitation due to transmission error is very small and as speed increases, the effect of the force also increases as we traverse through the first natural frequency of the system. Above that natural frequency, the force levels off some, before it excites the next natural frequency of the system. This approximation would provide a valid mesh force if we are operating above the lowest torsional natural frequency of the simple system of Figure 1. Another way of looking at this force is that it is the bearing force that would result if the inertias were very large so that they remain vibrationally stationary when running at speed. The key to performing an appropriate analysis of the mesh excitation is the evaluation of the distribution of forces along the contact lines. 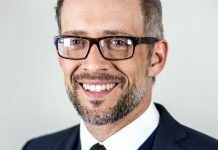 A requirement of this analysis is the ability to account for either the design tooth topographies or the actual measured topographies of the tooth surfaces. This analysis requires a good contact algorithm as well as an evaluation of tooth compliances. 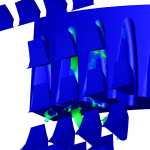 The analysis is certainly feasible using finite element analysis , but may also be done using elemental stiffnesses. In our case, a program called the Load Distribution Program , which essentially discretizes the contact lines into individual segments and then uses the equations below to solve for the load carried by each segment of the contact line. • Tooth base rotation and base translation using an empirical analysis based on non-dimensionalizing finite element analyses of mating gear teeth. It is interesting to note that each of these terms provides roughly the same magnitude of deflection, mainly because a gear tooth is a short, stubby plate such that the classic assumptions of beam theory are violated. The final stage of the analysis is to perform some simple statics analyses (sum of moments about bearing locations) in order to evaluate bearing forces. This essentially becomes a bookkeeping exercise, but in a single mesh that has each shaft supported by two bearings, requires doing force and moment analysis to evaluate the force at each bearing (four different bearing forces need to be computed). 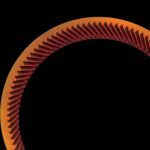 With helical gears, an axial force must also be included in the force analysis. 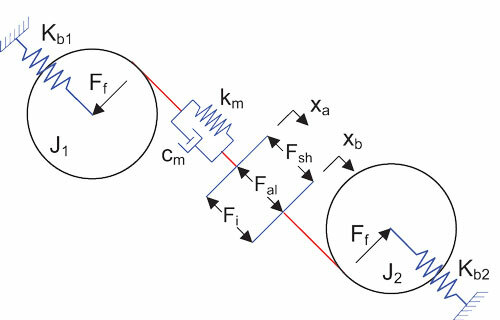 This axial mesh force not only creates an axial bearing force, but also affects the bearing forces along the line or plane of action. 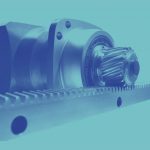 This latter component could be substantial when we are analyzing narrow face width gears that are common in manual transmissions and in transfer sets. It should also be pointed out that the á coefficients for each force component allow one to compensate for the relative housing force “coupling efficiency” of each force component. For instance, it is likely that axial forces at bearings are more efficient in creating radiated housing noise than are radial forces. 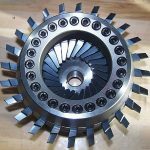 The high contact ratio helical gear pair whose design specifications are given in Table 1 will be used in an example to show the relative importance of the different mesh excitation components. This gear pair has been tested, both at NASA  and at The Ohio State University and has been shown to be an extremely low noise gear set. The modifications applied to this gear pair will be 17.8 micron of circular lead crown and 17.8 micron of circular profile crown as shown in Figure 3. 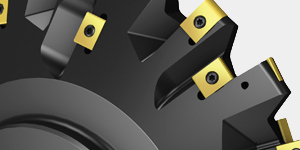 The circular profile modification usually provides for a low transmission error gear set and the circular lead crown, which has the main purpose of compensating for shaft misalignment, is typical of automotive gears. 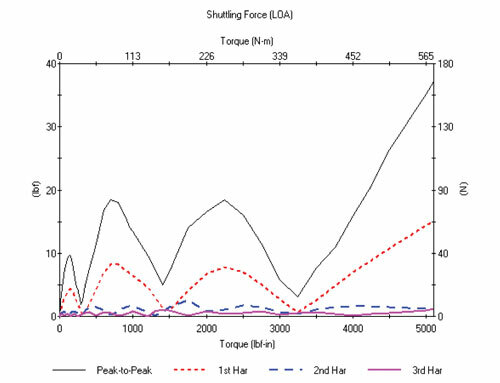 The analysis was first run at a mid-range torque of 339 N-m and the resulting bearing forces due to shuttling, transmission error and friction are shown in Figure 4, respectively. LOA refers to forces along the line or plane of action and OLOA refers to forces at right angles to the plane of action. A weighting factor of one was used for each force and only the right hand pinion bearing forces are shown. The other bearings have similar force traces but differ somewhat in amplitude. It should be noted that at this load, each force has a similar order of magnitude, thus making it difficult to state that one component is more significant than the other. In addition, the amplitude of the vector sum force is computed by taking the square root of the sum of squares of each of the LOA, OLOA, and axial components of the bearing force. This is shown as total forces in Figure 4. The first mesh harmonic of this force will be referred to as FORCESUM in later discussions. The fact that the amplitude of the first harmonic of some of the forces is less than some of the individual components shows that some of the forces cancel one another. 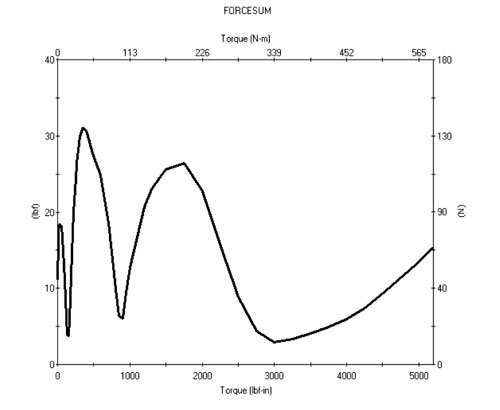 Next, we perform simulations at 50 torques and show the effect of torque on each of the force components as well as the effect of torque on other pertinent engineering quantities such as the force carried by one tooth pair, contact stresses, transmission error and effective contact ratio. 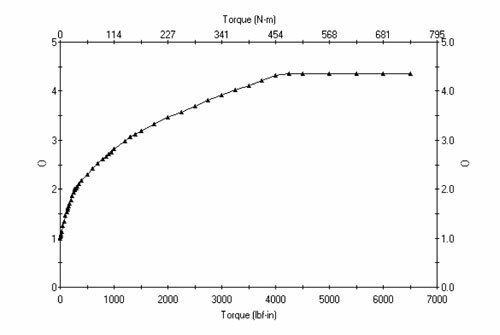 Figure 5 shows that as torque increases, the load carried by a single tooth pair also increases. 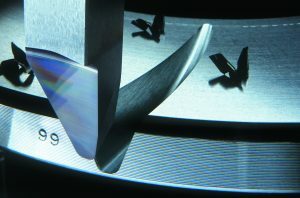 Also, the duration of contact increases with load, indicating that more tooth pairs are sharing the load as torque loading increases. The length of this contact on the x axis is normalized to base pitch and this contact length for any load is actually the average number of tooth pairs in contact, which may also be considered to be the “effective total contact ratio” of the gear pair. Figure 6 shows how this effective contact ratio increases with load. 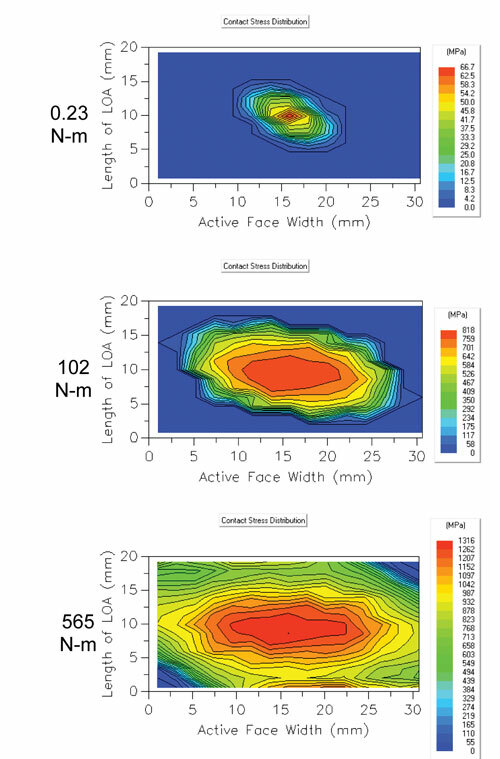 Figure 7 shows, for three of the loads, the contact stress distribution across the zone of action of a single tooth pair. 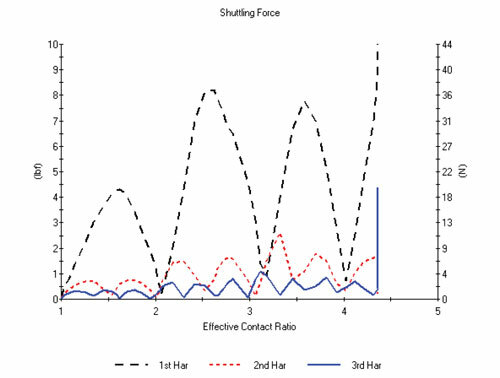 The outline of this contact stress zone is a prediction of the contact pattern for the tooth pair and as we see, as load is increased, the contact pattern spreads out across the tooth area, again an indication of the increased effective contact ratio with load. Figure 8 shows a Harris Map of transmission error as load increases . This map, which plots the transmission error trace at each load, shows that at no load, the transmission error mimics the non-conjugacy of the tooth pair along the path of contact on the tooth. As the load increases, the load starts being shared by additional tooth pairs and the transmission error trace alternately flattens and then increases in amplitude. By following the dashed line down the load traces we essentially trace the location of the load transfer from one tooth pair to the next as well as identifying the non-conjugacy of the gear pair over a longer length of the contact path. 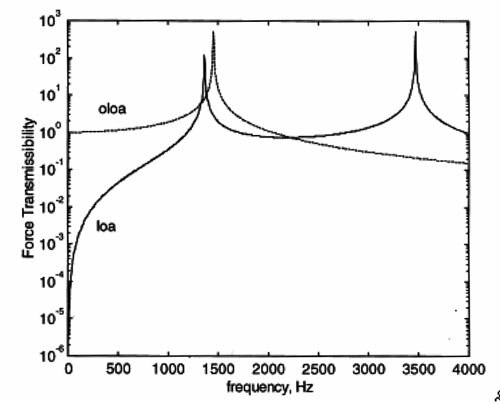 Figure 9,Figure 10,Figure 11 and Figure 12 show the effect of load on the different excitation forces and their lower harmonics. One sees that both the transmission error force and the shuttling force tend to alternately increase and decrease with load. It appears that each time another tooth pair comes into contact, the force value minimizes, with the number of minimizations roughly correlating with the total contact ratio for the first harmonic and double this number for the second harmonic and triple for the third harmonic. It is interesting to note that the loads for each minimization are different for the shuttling force than they are for the transmission error force. Also, the minimizations are not evenly spaced with load. It is interesting to note that these minimal points are not evident in the friction force plot where the friction force increases continually with load. When vectorially adding the forces into the FORCESUM term defined earlier, Figure 13 shows that the minimizations still occur, but now the relative amplitude of the transmission error force and the shuttling force will drive the minimum load location. In this case, the transmission error predominates over the shuttling force so the minimum excitation torques seem to follow those of transmission error. Figure 14 shows the first three harmonics of transmission error force plotted versus effective contact ratio and we now see that the minimization locations are equally spaced in this plot. It is interesting to note that the spacing of the first harmonic minimums is at about 1.1 base pitches and the spacing of second harmonic minimums is at about 0.5 base pitch. The third and higher harmonic minimizations (not shown) are also equally spaced. 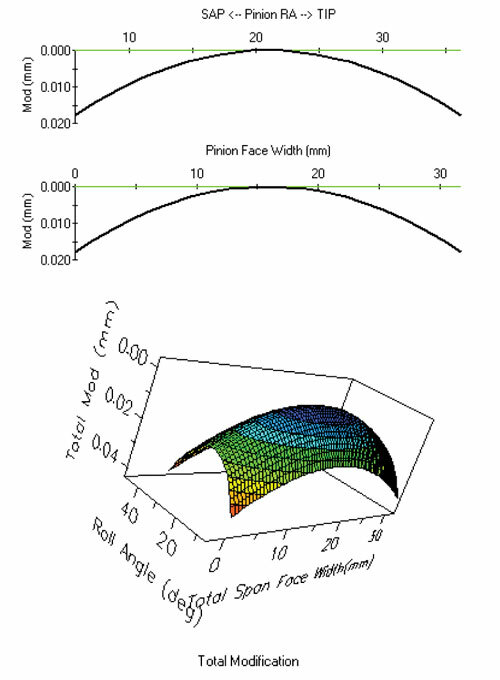 Figure 15 and Figure 16 show the shuttling force and friction force plotted versus effective contact ratio. The shuttling force minimizations also are equally spaced, but have minimum values at different contact ratio values than do the TE force values. In this presentation of friction force, where we look at its harmonics, we see an indication that there are some torques that have lower friction forces than do other torques, but with much less consistency than the other values. 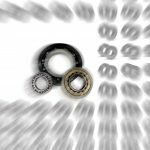 Traditionally, designers have limited their thoughts on gear noise to trying to minimize transmission error. The FORCESUM metric defined here has similar results to transmission error but may explain why in practice, reducing transmission error beyond a given threshold does not continue to reduce noise. Often modelers and also experimentalists run data at a single load or at a small number of loads. The up and down effect of load on the transmission error force and shuttling force would indicate a danger of false interpretation of such results. For instance, in Figure 9, if we had analyzed or measured noise at the low TE load, and then if we increased the load by 10 percent, we would get a significantly higher value of transmission error force. Hence, a single load data point could be significantly different than a load that is slightly higher or lower. 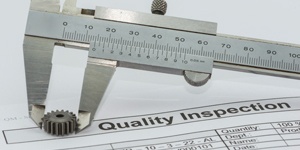 We therefore highly recommend that in analyses or measurements, the load be continuously swept through the noise load range. 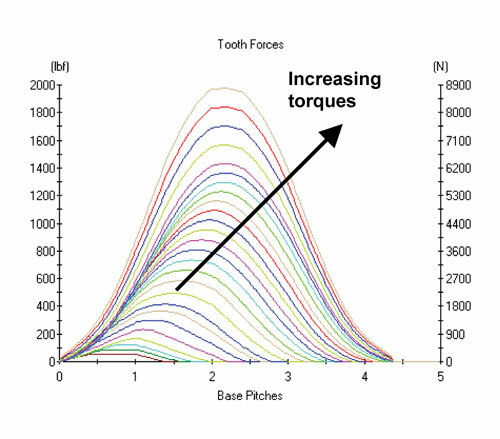 An obvious next step is to try to identify modifications in the tooth shape that will reduce the mean excitation curve as load is swept through the torque range. A simple approach that has been reported in the literature  is to slightly twist the tooth shape by adding what is called “bias,” where “bias out” modifications remove more material from the entering and leaving regions of contact and “bias-in” modifications remove material from the opposite corners of the teeth. In this case, we added two levels of both bias-in and bias-out modifications to the original modifications in order to study their effect on the bearing excitations. Figure 17 shows how a bias modification affects the total modification that is applied. 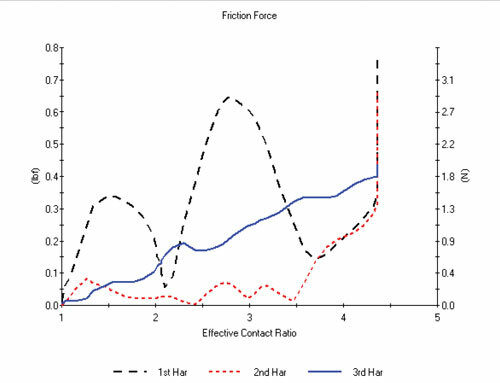 Figure 18 shows that bias-in tends to increase the “effective contact ratio,” while bias out has the reverse effect. 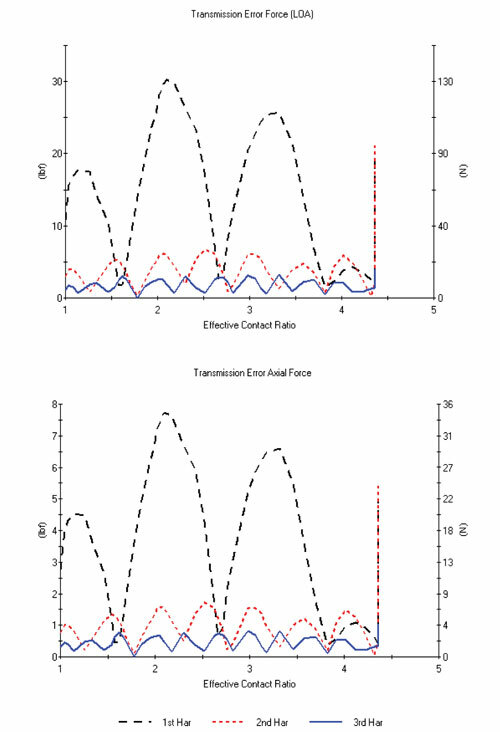 Figure 19 and Figure 20 show the effects of the bias modifications on transmission error forces and FORCESUM, respectively. 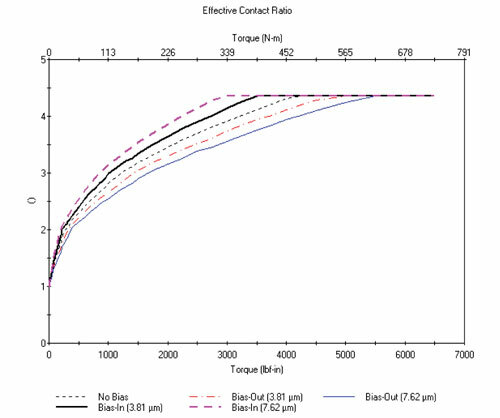 We see that for both quantities, the larger bias-in modification greatly flattens the torque response across the middle torque range and hence, this might be one means of achieving a more robust tooth shape for noise minimization. 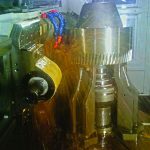 Although this analysis has been performed for a helical gear pair, it has similar implications for other types of gears such as spiral bevel, hypoid and worm gears in which the lengths of the lines of contact progressively increase as the load increases. In fact, similar Harris Maps are found for these gear types and the effect of bias is projected to have similar results. It is obvious that there needs to be much experimental work done to isolate the different force excitations in order to verify the theories that are presented in this paper. Also, the forces due to impact and entrapment that are assumed to be small in this analysis need to be further studied so that they may be better quantified. 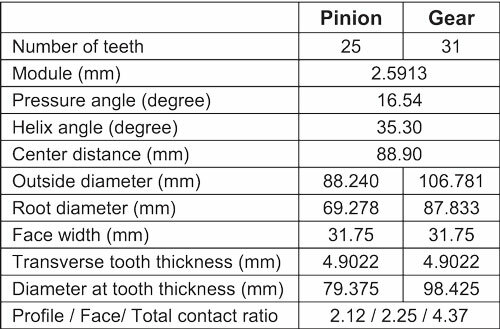 The sensitivity of the designs to variation in the tooth modification parameters may be great, so analyses should go further to identify the sensitivity of individual designs to manufacturing variability. There has been a wealth of dynamic modeling of gears, yet most models only consider one or two of the force metrics that are discussed in this paper. Further dynamic modeling should include each of the excitations that are proposed. Bias should be measured in all gear sets in which noise is a problem. 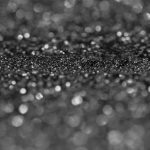 There may be a correlation between bias and noise that cannot be picked up with conventional measurements that take only one lead and one profile of each measured tooth. Since the results of these models predict different bearing forces from the simple changing of the hand of the helix angle, another set of experiments should be run with identical gears, but with different helix angle hands. 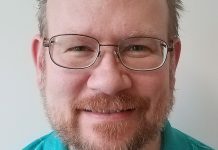 An approach for incorporating all of the known excitations of gear noise into a single metric has been proposed. Being based on static load distribution calculations, this metric is static in nature so may be used by gear designers prior to performing dynamic simulations, It has been shown that the excitation predictions are highly load sensitive, so that the interpretation of both model results and experiments should occur at a series of loads within the desired load region. Finally, it is shown that bias modifications can have a pronounced effect on gear excitations and they should be considered both in designing new tooth profiles and when measuring noise of existing gear sets. 1) Houser, D. R., “Gear Noise Sources and Their Prediction Using Mathematical Models,” Gear Design Manufacturing and Inspection Manual, SAE 1990, pp. 213-222. 2) Welbourn, D. B., “Fundamental Knowledge of Gear Noise – A Survey” , Inst. Mech. Eng. Conf. 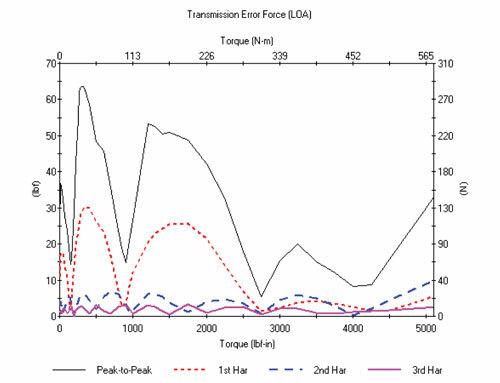 on Noise and Vibration of Engines and Transmissions, Inst. Mech. Eng. Aut. Div., 1979, pp.9-14. 3) Niemann, G. and Baethke, J., “Transmission Error, Tooth Stiffness and Noise of Spur and Helical Gears, Part 1 (Drehwegfehler, Zahnfederharte und Gerausch bei Stirnradern),” VDIZ Vol 112, 1970. 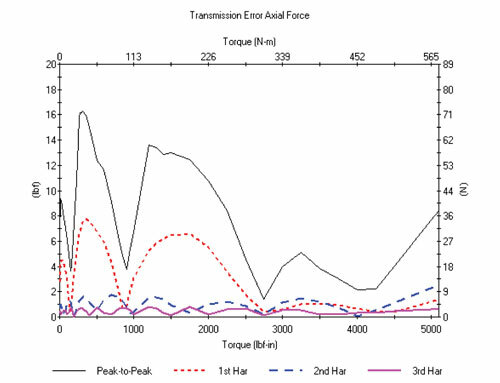 4) Baron, E., Favre, B., and Mairesse, “Analysis of Relation Between Gear Noise and Transmission Error,” Proc. INTERNOISE-88, 1988. 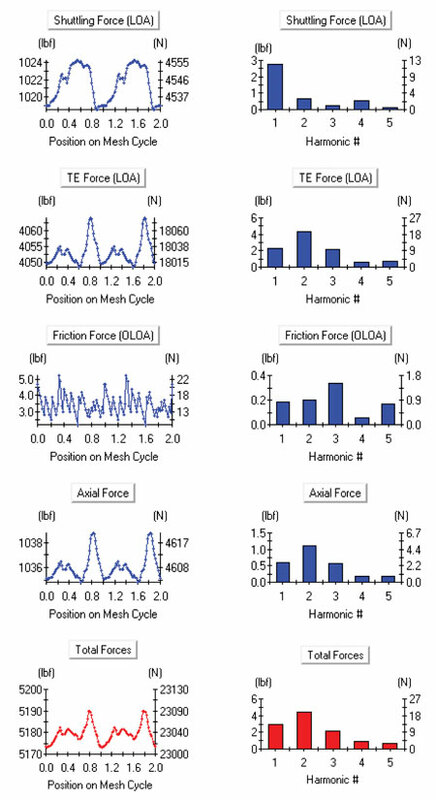 5) Kubo, A., Nonaka, T., Kato, N., Kato, S., and Ohmori, T., “Representative Form Accuracy of Gear Tooth Flanks on the Prediction of Vibration and Noise of Power Transmission,” AGMA Paper 92FTM9. 6) Mark, W. D., “Gear Noise Excitation,” Plenum Press, New York, 1989. 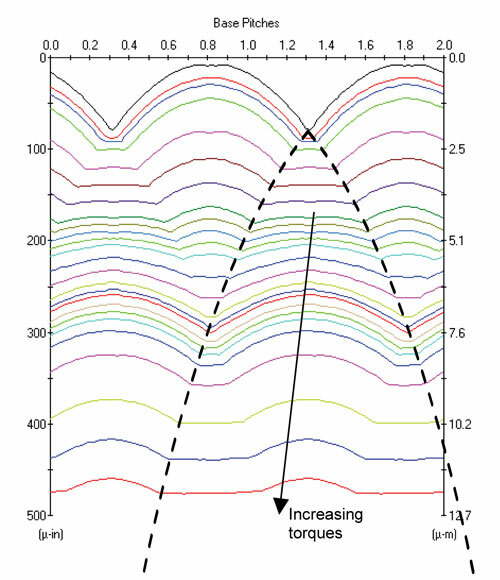 7) B?rner, J. and Houser, D. R., “Friction and Bending Moments on Gear Noise Excitations,” SAE, Paper 961816, Vol. 105 No. 6, pp. 1669-1676. 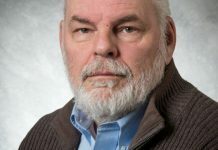 8) Houser, D. R. and Harianto, J., “Design Robustness and Its Effect on Transmission Error and Other Design Parameters,” The International Conference on Mechanical Transmission, 2001. 9) Vaishya, M. and Houser, D. R., “Modeling and Analysis of Sliding Friction in Gear Dynamics,” Proc. 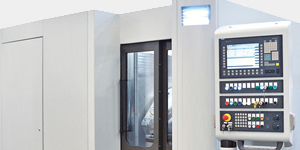 of DETC’2000, ASME Power Transmission and Gearing Conference, PTG-14431, 2000. 10) Ishida, S., “On the Friction Noise and Pitch Circle Impulsive Noise of Gears,” Proc. JSME Semi-International Symposium, 1967, pp. 161-170. 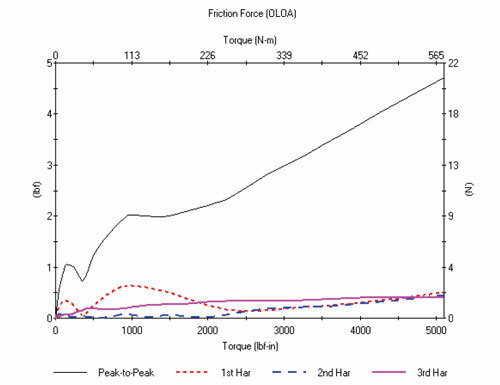 11) Iida, H., Tamura, A., and Yamada Y., “Vibrational Characteristics of Friction Between Gear Teeth,” Bulletin of the JSME. 1985 July Vol. 28, No. 241, pp. 1512-1519. 12) Donley, M. G., Lim, T. C., and Steyer, G. C., “Dynamic Analysis of Automotive Gearing Systems,” SAE International Congress and Exposition, 1992, SAE Paper 920762, pp. 77-87. 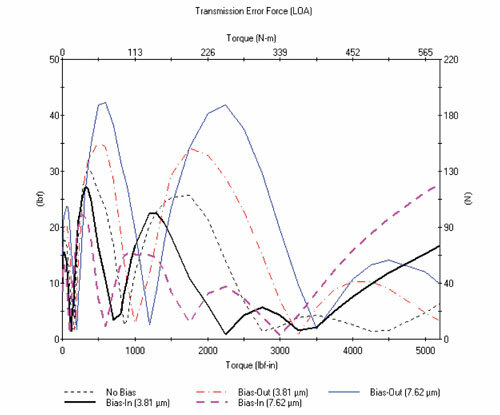 13) Campbell, B., Stokes, W., Steyer, G., Clapper, M., Krishnaswami, R., and Gagnon, N., “Gear Noise Reduction of an Automatic Transmission Through Finite Element Dynamic Simulation,” Proc., SAE Automotive NVH Conference, SAE Paper 971966, 1997. 14) Hochmann, D. and Houser, D. R., “Friction Forces as a Dynamic Excitation Source in Involute Spur and Helical Gearing,” Proc. of DETC’2000, ASME Power Transmission and Gearing Conference, PTG-14429, 2000. 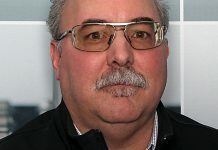 15) Vijayakar, S. M. and Houser, D. R., “Contact Analysis of Gears Using a Combined Finite Element and Surface Integral Method,” AGMA Fall Technical Meeting 1991, 91FTM16 and Gear Technology, July/August 1993, pp 26-33. 16) Houser, D. R. and Harianto, J., “Load Distribution Program Manual,” The Ohio State University, 2002. 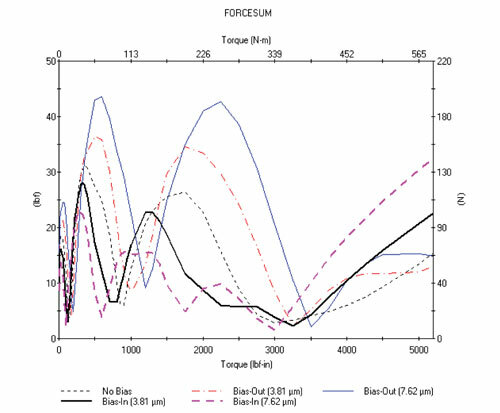 18) Gregory, R. W., Harris, S. L., and Munro, R. G., “Dynamic Behavior of Spur Gears,” Proc. I. Mech. E. No. 8, Apr. 1953, pp. 207-226. 19) Maki, H., “A Study on Definitions of Tooth Modifications of Helical Gears Relevant to Gear Noise,” The JSME Int. Conf. on Motion and Power Transmissions, 2001, pp. 57-67. 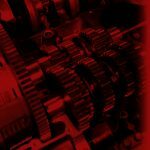 The authors would like to thank the 30-plus corporate and foundation sponsors of the Gear Dynamics and Gear Noise Research Laboratory for providing funding to support this effort. Copyright(C) SAE International.